Pride of the Air Force is the F-104 Starfighter, a superior Mach two fighter. 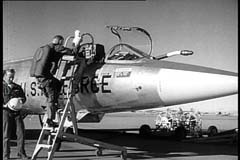 Holding an altitude record of over 103,000 feet, the F-104 has a J79 turbojet engine and carries a 20-millimeter cannon and Sidewinder missiles. It also is capable of carrying underwing podded T-171 cannons for ground attack or tactical support. A high-performance weapon system, this deadly adversary is a worthy addition to our defense arsenal. The F-105 Thunderchief is a Mach two all-weather fighter-bomber designed to accomplish the numerous tasks of tactical air operations. It has high and low speed stability, a complete radar, navigation and bombing system and is capable of delivering a complete family of high explosive ordnance. 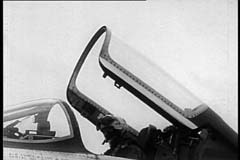 The F-105's all-weather ability enables it to go any time and aerial refueling permits it to go anywhere. This remarkable aircraft stands as another mark of scientific achievement. Covers activities of the AF Space Vehicle Recovery personnel in their amazing feat of snagging space capsules in the air. Reeled aboard, the capsule is rushed to Air Force laboratories for complete study. Size and weight of other re-entry vehicles such as the one used to carry America's first astronaut precludes air recovery. 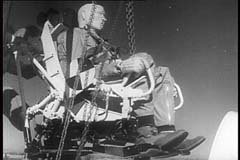 This capsule is recovered by Air Rescue specialists wearing SCUBA equipment who jump into the sea and quickly install a special flotation device to prevent the capsule from tipping or sinking. The use of high power rocket sleds has revealed much information about acceleration and deceleration problems in space research. 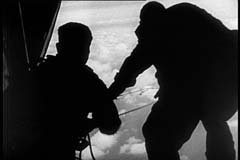 Racing down a track at high speeds, the sled, equipped with an ejection seat in this particular case, catapults a dummy wearing a parachute to show the effects of negative "G" forces at high onset rates. The increasing demand for knowledge about human endurance in high speed jet flight and space flight is constantly being met through such explorations as rocket sled research. This picture story highlights the flying skill and marksmanship of tactical pilots in today's Air Force. 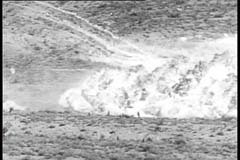 Demonstrating their techniques for countering aggression, the pilots let go with cannon fire rockets, napalm and Bull Pup missiles. 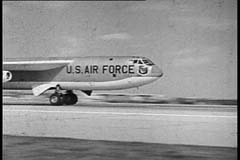 Strategic Air Command's long range B-52 bomber is a powerful eight-jet, swept wing aircraft that operates at high altitudes and has a global striking potential. The B-52 displays the combined advantages of carrying long range guidance and supersonic missiles. Called the backbone of SAC, this aircraft is a vital part of the tremendous retaliatory striking power of the Air Force. From their home base in Orlando, Florida, cameramen of the Air Photographic and Charting Service reach out to all points of the globe in fulfilling their assignments. Their job is to record important Air Force achievement anywhere in the world - in peace or war. 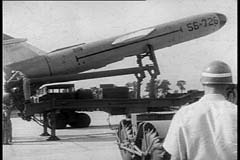 Skilled specialists capture on film testing of new aircraft and equipment, experiments in aerospace medicine, in-field mobility exercises, firing of giant rockets - just to name a few. 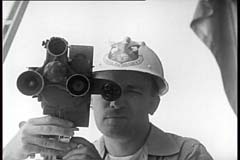 Thus, the USAF cameramen play a vital role in contributing importantly to the eventual conquest of space. An important part of our tactical strike force is the hard hitting TM-76A Mace pilotless bomber. This weapon system is powered by a 100,000 pound thrust booster and a T-33 turbojet engine and can be launched from a hardsite or a mobile trailer known as a Trans-launcher. Dependable and deadly accurate the Mace adds considerable strength to our deterrent force.